Maggie has had a tough year. The last twelve months brought a lot of changes for her and we all know, cats are not particularly fond of change. Losing Marie and leaving her home where she lived as an only cat with one parent, was a difficult transition for Maggie. You could see sadness in her eyes. She missed Marie and she didn’t like sharing her new home with Annie and Eddie. Maggie was nervous, she spent a lot of time licking her lips and when she wasn’t cowering she was plotting an attack, mostly against Eddie. I tried my best to make space for Maggie to relax and get away from the rambunctious kittens. Most days, Maggie would spend time with me in the office perched up on the desk where she could see the kittens approach, and that is when I first noticed Maggie had difficulty breathing. Maggie is overweight. At first, I thought she had really short legs, but then realized she was just so overweight her belly nearly touched the ground when she walked. I thought maybe Maggie didn’t feel good and that might be why she was so intolerant of the kittens, so we took her in for an examination. Other than being an overweight cat, Maggie was in good health. 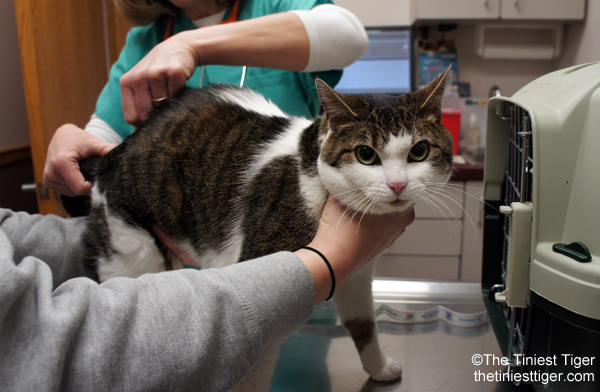 But, being an overweight cat brings health risks, and Maggie is not alone. Cat parents that have tried to help their cat lose weight by cutting back on treats and controlling portions, might have failed in the past especially when your cat gives you the sad eyes. If you are like most cat owners, you might associate giving food as giving love. No cat parent wants to feel like they are depriving their cat, even when they know it is for their cat’s own good. Last November, after trying everything to help Maggie acclimate to living with Annie and Eddie, we made the tough decision that Maggie would be happier living in a home where she would be the only cat. I am thrilled to tell you Maggie is thriving in her new home with two adoring parents where she is the queen of the castle. Even though Maggie continued to shed some weight since she moved last November, she weighed in at 13.1 lbs down from 13.8 lbs, when I learned of the new Metabolic Advanced Weight Solution from Hill’s® Prescription Diet®, I thought Maggie was perfect for this program. Her doting parents agreed. The first step is to make sure your cat is in good health and ready to start the weight loss program. 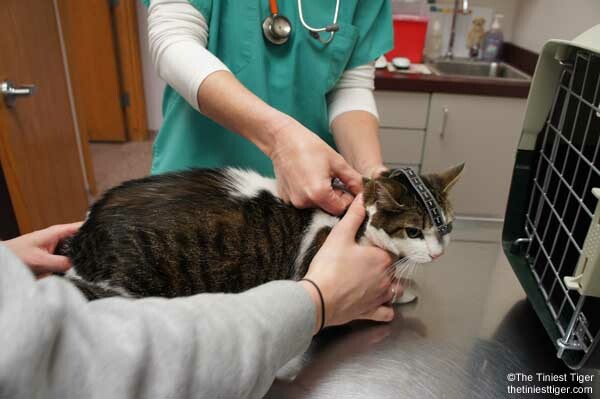 It is important for your veterinarian to measure and assess the ideal weight for your cat and give you the suggested portion of dry and wet food. Dr. Teresa checks Maggie to make sure she is healthy! Maggie got the green light to join the cat weight loss program. 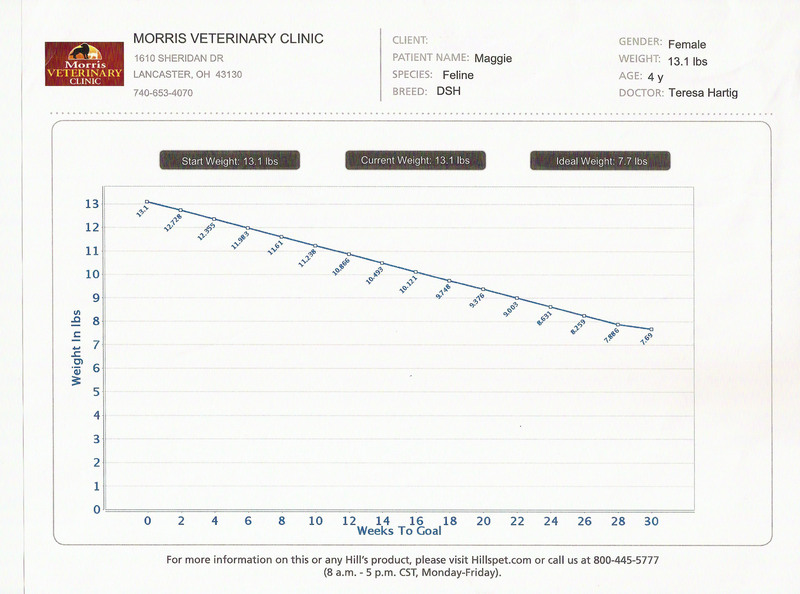 Next, Dr. Teresa took her measurements to calculate Maggie’s ideal weight. Maggie is a very good patient. And a few more measurements. Now, the calculations to determine Maggie’s goal weight. Maggie’s Ideal Weight is 7.7 lbs! It was no surprise that Maggie needed to lose weight, but when the results showed her at 52.5% body fat, we were all a little shocked. We knew for sure this was the best path for her. Everyone that loves Maggie wants her to live her best life. Slow and steady is the best way for a cat to lose weight. Because Maggie needs to lose a considerable amount, it will take her about 30 weeks to reach her goal weight. 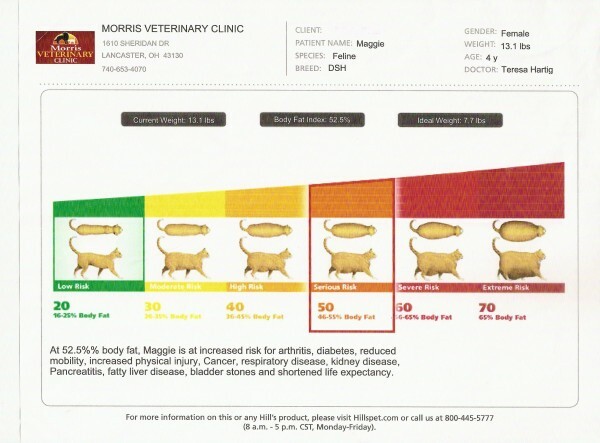 Maggie’s recommended daily food intake is 1/4 cup dry Metabolic Advanced Weight Solution and about 3 ounces of the wet Metabolic Advanced Weight Solution. How is the Metabolic Advanced Weight Solution Different? 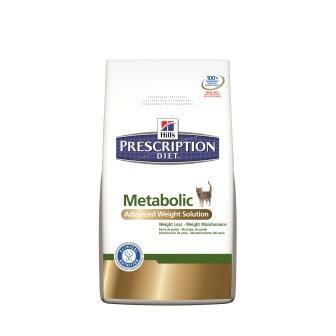 Hill’s Prescription Diet Metabolic Advanced Weight Solution includes a complete portfolio of dry, wet food, and treats designed to work together for easy, flexible weight loss success without deprivation. 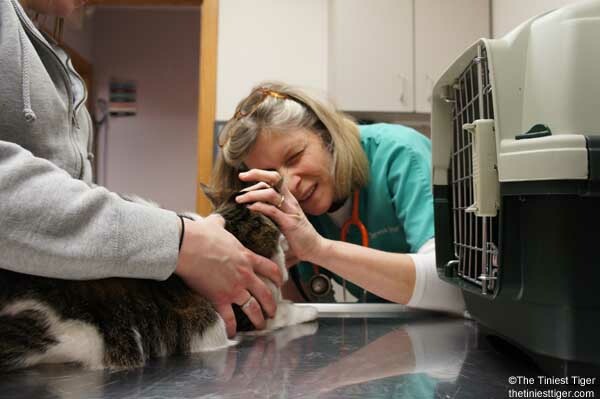 This makes it easier for cat parents to keep their cats on the program and to comply with their vet’s recommendation. Without strict protocols or precise measuring, 88% of pets lost weight in two months at home. 8 out of 10 pet parents said they would recommend the Metabolic Advanced Weight Solution to a friend with an overweight pet. But How Does Metabolic Work? 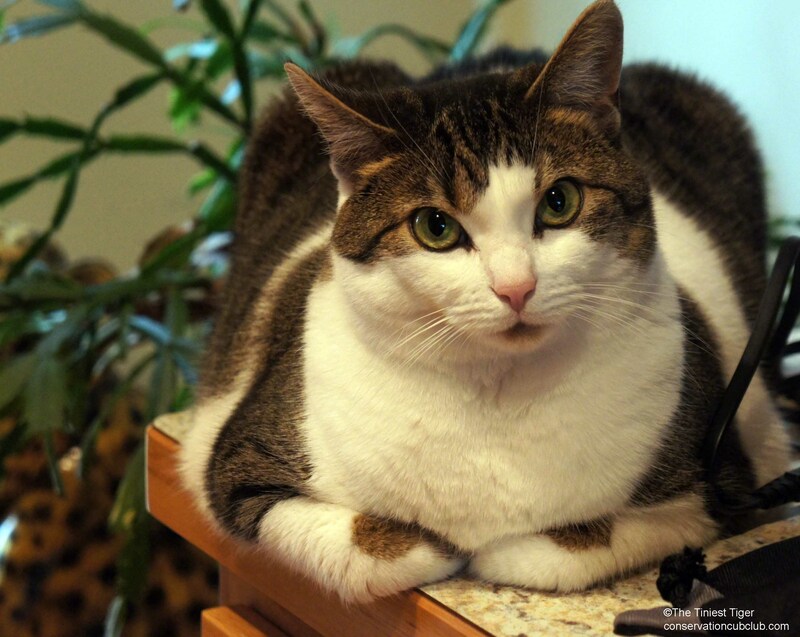 Transform your cat’s weight by changing what you feed, not how you feed. The Metabolic Advanced Weight Solution is safe, effective and fast. You will see a leaner, more playful cat in just 60 days! Would You Like Your Cat to Join Maggie in the Cat Weight Loss Program? Do you have an overweight cat that you would like to join Maggie on the Metabolic Advanced Weight Solution cat weight loss program? 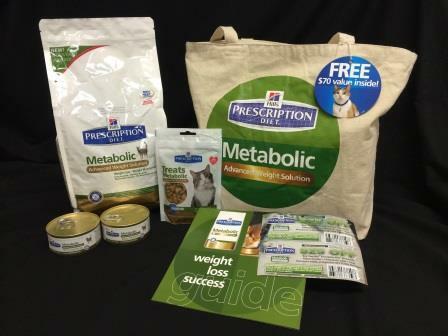 Hill’s Prescription Diet will give to 10 members of The Tiniest Tiger community the opportunity to try Metabolic Advanced Weight Solution for your cat or dog, with your veterinarian’s authorization. 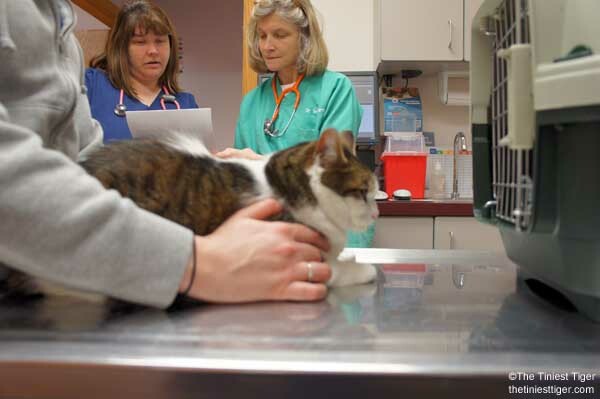 Just like us, a doctor should be consulted prior to starting a weight loss program so you will need to get your veterinarian’s approval before starting your cat or dog on the program. To enter, please enter the required information in the giveaway widget below. Leave a comment below this post telling us if you have tried to help your cat lose weight before and ask any questions you would like to know about the new Metabolic Advanced Weight Solutions food. Enter your first and last name along with a valid email address in the giveaway widget below. Your name and email address will not be published but will be submitted only to The Tiniest Tiger. Your name and email will only be used to contact you if you are a winner of the giveaway. 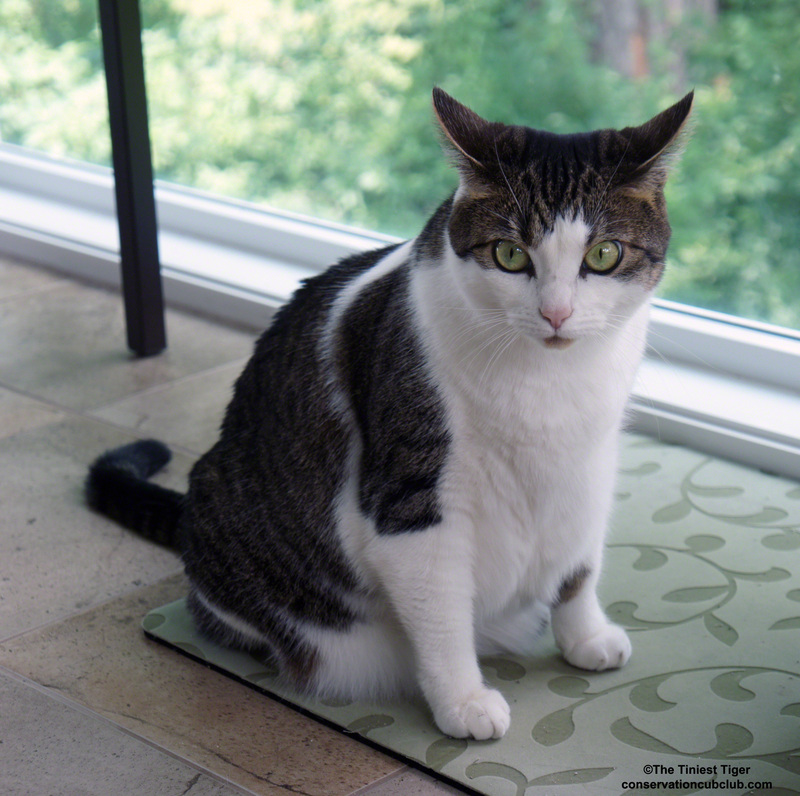 Do you have a Cat or Dog that will be participating in the weight loss program? Entries will be accepted from April 23-May 6, 2014 at 11:59 pm Eastern. This giveaway is limited to one winner per household and is for U.S. residents only. Void where prohibited by law. Winners have all been notified via email! Thank you so much for your interest in helping your cat to a healthy weight! This post is sponsored by Hill’s. I am being compensated for helping spread the word about Hill’s Prescription Diet Metabolic Food, but The Tiniest Tiger only shares information we feel is relevant to our readers. Hill’s Pet Nutrition, Inc. is not responsible for the content of this article. *Klausner JS, Lund E. Banfield Pet Hospital State of Pet Health 2012, 2012. Judy, you should have received an email from me. you were one of the winners! OM! Yay! I was hoping I was! Feather needs this sooo much! Poor girl. I am super excited!! Do you know which email? Hmmm Would it have come from Joanne or Conservation CC or Tiniest Tiger? I just sent the email to you again. It came from my gmail account. Maggie was such a good sport about going to the Vet. 🙂 We are also taking part in this trial and I am excited to see how all our pets fare. I have a feeling we’ll all have leaner pets by the end of it! I do cat & dog rescue & currently have 5 dogs & 18 cats! I live on 2 acres that border 6000+ acres of wildlife managed property with a little creek behind my property. Anyway, to the cats, most are formally feral and live in the barn. I have made little “nests” for all of them with cat carriers, old ice chests with holes cut in them, & cardboard boxes inside garbage bags & then put inside another cardboard boxes with holes cut in them. My problem cat is my baby, Chat, a “little” bottle fed man of 5 years old that weighs 25 lbs. He begs for food constantly & freaks out if his food bowl gets below half full. He’s my spoiled little man & I love him so. I have a one yr old dog that weighs 78 pounds. She’s a lab/mastiff mix. This is a great post and very informative for other cat parents who are struggling to control their babies weight gain! Thanks for sharing! Stewart, my mom’s cat, is about 10, (not sure when he was born)…He weighs around 25-27 pounds :/ This food sounds like a real good way to help him…Thanks so much! Holly is 6 years old and about 13 lbs. I have tried the Purina One Healthy Metabolism food, but it doesn’t really seem to be helping much with her weight loss. Would love to try something different to help her lose some weight! My cat, Feather is 28lbs! I have tried feeding her on a schedule, wet food, dry “weight control” food, everything. The vet told me to play more with her. I do, she just cant play, she is too large. I feel so bad for her! She really needs help, it has started to effect her walking. Please help me to help Feather <3 Thank you! I need to try this. all my 13 cats ages 1-12 years are over weight. Vet has them on precription Royal Canine(sp) diet and dont see any difference.